So far we have been making butterfly prints using paint and mixing the colours! 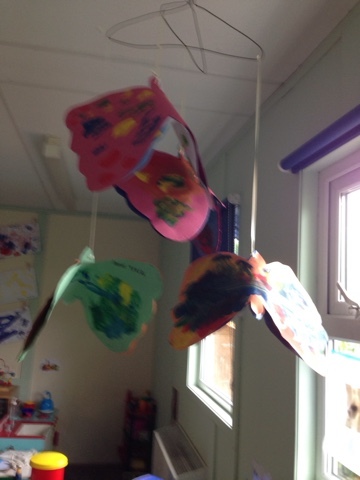 They really loved this and our classroom is now the proud home of a butterfly mobile made from two metal coat hangers and string! We have also used our mark making skills on big circles of paper after taking about the very hungry caterpillar. We sat outside and drew what we saw around us, spotting butterflies fluttering around! They have also really enjoyed talking about the fruits that the hungry caterpillar eats. I had a bag with the fruit inside, and we sang a song "what's in the bag" then they were able to select a piece of fruit in turn. Tomorrow I am going to put a watermelon in the bag as well!